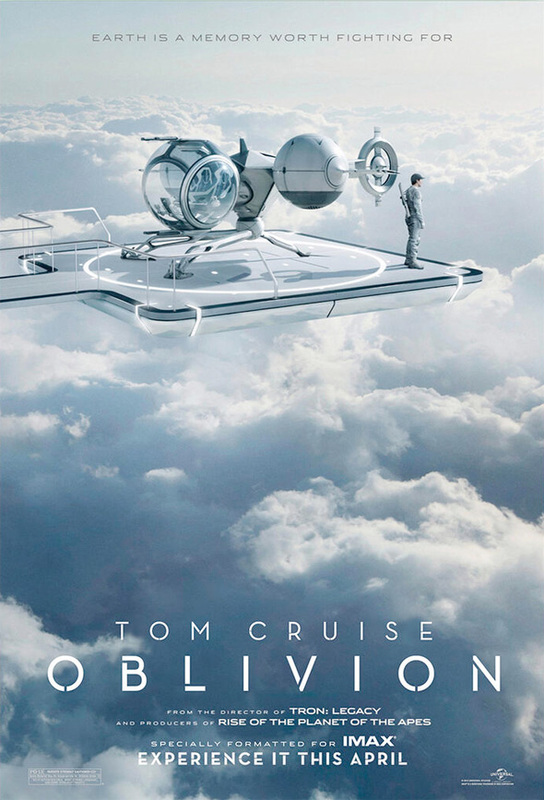 The IMAX featurette for Joseph Kosinski's new sci-fi film Oblivion just showed audiences how it was specifically formatted for the giant screen without being shot on the large film stock, and the soundtrack from M83 is available for streaming online right now. With the film just two weeks away, one final poster highlighting the IMAX release of the film has arrived and it puts Tom Cruise and his trusty bubble ship high up in the sky. It's a pretty gorgeous shot, and I'm continually impressed with how Cruise isn't being used as the focal point of the poster campaign. His name is prominent, but the film's landscape is the star. im the first one to say, Oblivion looks promising, but hopefully TCruise is not having a dream!! Brought to you by the same guy who designed Apple devices. Kosinski actually went to school to become an architect which I find quite interesting. I knew that, and it shows in Tron. Not a good film for my standards though. I actually like Tron, but I know I'm in the minority there. Also, the shortfalls of Tron can be chalked up to someone making a film that has never made a film before. Kosinski was thrown to the studio wolves and I think it will make him a very strong director, but I guess we'll see with Oblivion. I don't know how much Kosinski had to do with the character of Quorra, but I liked how Olivia Wilde played her sort of quirky and goofy. I wouldn't mind if she'd intensified that considering the nature of her being. And I will remember beautiful last shot, very last I think, of the couple driving away on a motorcycle. Made me wish the film didn't take place in virtual environment. Yes, I also liked her character a lot. Although I prefer the majority of a TRON movie to take place on the Grid. It looks like he's standing next to a mutant helicopter with issues. Love the poster, and stoked for the movie... He looks pretty fake though. Plus points for not having a giant floating TC head on the poster.